As I’ve grown older I’ve realised that skincare is so much more than taking your makeup off with a face wipe before bed. I now have an overflow of go-to products with a skincare routine which works for me and I feel like I’m winning at adulting. Gone are the days when skincare seemed like a chore, now I relish in each and every one of the products I use and I'm forever social stalking beauty bloggers and beauty editors for must have products and newest releases (Sophie Beresiner and Alex Steinherr I’m looking at you!). I also try to have one make-up free day at the weekend, to give my skin a break. 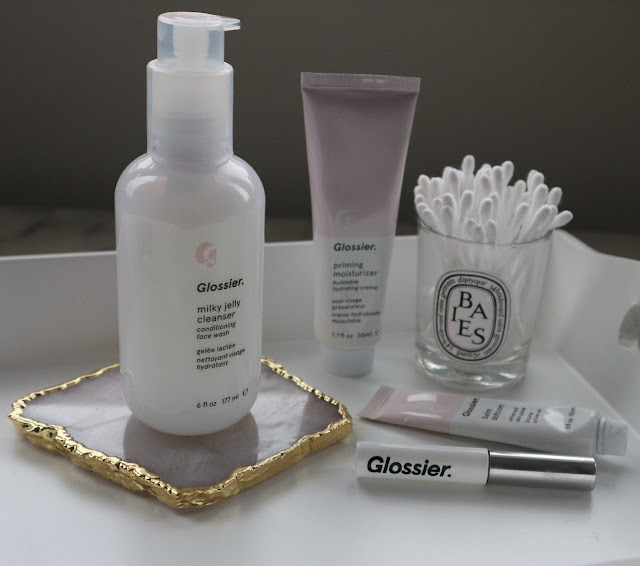 One of my biggest beauty revelations of 2017 was Glossier. I’m sure you will have heard about them by now, but after being desperate for months and months to get hold of their products they are finally available to order in the UK. One of my favourite products is the milky jelly cleanser, I have tried so many cleansers I’ve lost count but this is ‘the one’. I am already on my second bottle and use it religiously every day. I just love how it feels on the skin and it’s ability to melt and budge the most stubborn of make-up. Another favourite from them is Boy Brow (I know this is technically make-up but I just had to give it a shout out!) this is the answer to my lazy girl wants perfect-but-messy-brow prayers. I literally want to bulk buy it so I’m never without! Have you tried any Glossier products? Which is your favourite? Along with Glossier, another brand I fell in love with was The Ordinary. Looking at their prices, I couldn’t quite believe the quality of these products! The salicylic acid is my spot buster hero – if I can feel a spot coming through I simply dot with this before bed and come morning it’s like it never happened! One of the steps in my skincare regime which I never miss is The Ordinary's hyaluronic acid. After cleansing, I just add a few drops onto the palms of my hands, rub together and then pat onto my skin before moisturising. I find this step is essential to locking in moisture and I can always see a difference in my skin when I don’t use it. I am also a massive face mask fan and usually pop 1 or 2 on every week. One of my favourites from last year was the Himalayan charcoal purifying glow mask from the Bodyshop. As it’s drying you can literally see the oil being drawn from your pores and once washed off leaves your skin so soft and glowy! Plus it smells incredible. A firm favourite and one I will be repurchasing! As I said, I'm always adding to the ever growing shelf in my bathroom (much to David's dismay!) So I will probably do another update soon and possibly a make-up heroes post if you're interested? Please leave comments below with your favourite products – I love hearing recommendations from you!